Hayder Aziz is the CEO of Modern Eco Tech, which conducts environmental impact assessments for the oil industry in Iraq. Here he gives Robert Tollast an on-the-ground perspective of Iraq’s “energy revolution,” with some surprising revelations. Oil revenues comprise 70% of Iraqi’s GDP, hitting $8.4 billion last month alone. But the oil sector typically employs very few people – roughly 10,000 for every million barrels produced. Meanwhile, unemployment in Iraq is still huge, something the state tries to remedy by employing lots of people, including over 1 million in the security forces. Oil multinationals have various schemes to train Iraqis, but are they doing enough? For countless other Iraqis, a lack of required skills means there’s a slim chance of working in the energy sector, or even getting local work as a security guard. Many workers are brought in from other provinces, a bitterly ironic hangover from the Saddam era. If failure to alleviate unemployment isn’t bad enough, the dramatic increase in oil production also comes with more environmental hazards, despite tougher regulations. Last year in Basra (a city of 2 million people) a pipeline broke and almost contaminated the city’s drinking supply. The oil boom has also raised difficult questions regarding how oil revenues are divided within Iraq, not just among the main ethno-sectarian groups (as often reported) but also among regions. “Locals certainly demand more of the oil revenues, but since the main political parties are centralist, nothing much apart from a few ‘symbolic’ things will really happen,” Aziz warns. Despite the problems outlined above, Iraq’s energy revolution still carries great promise. Revenues are paying for a colossal amount of reconstruction such as the al-Faw port near Basra, which will be one of the largest in the Middle East when completed. Countless other projects mean that when cement production near Karbala reaches 2 million tonnes next year, most of that will be for domestic consumption, which will hopefully lower unemployment. But therein lies the problem. But what about the news reports we hear of Iraqis buying cars and visiting brand new shopping malls? Aziz is incredulous. 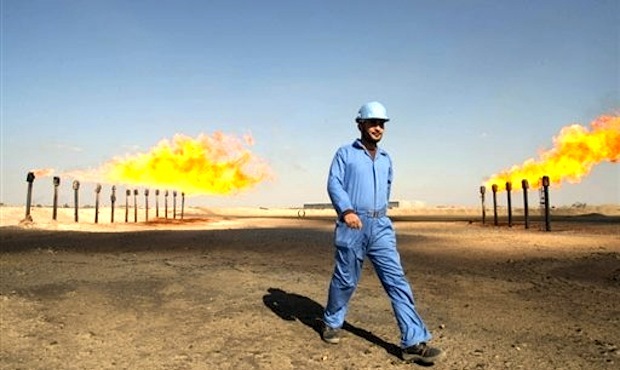 Despite this danger of a “resource curse” paradox where resource rich developing countries become addicted to easy revenues, Aziz feels that Iraq has got a good deal from auctioning off its oil fields to foreign companies. Could Iraq have used oil revenues to build a totally nationalised industry, free of foreign involvement? Despite substantial involvement in Iraq, foreign companies often complain about how difficult it is to do business there, and for a while now some even say the issue is not security, but bureaucracy. “The oil ministry try their best. But the problem is importing materials, exporting materials and getting visas, all of which is under the direct control of the prime minister’s office, who are concerned with politics much more than speeding up Iraq’s economic development,” Aziz points out. Despite the horrific surge in violence across Iraq in the past couple of months, the vast majority of security incidents occur in the centre and north of the country, well away from most of the crucial infrastructure in the south. To underscore how much has changed, Aziz tells me an amusing anecdote about the security situation. Don’t the foreigners drive around in four-wheel drive vehicles with sinister, heavily armed private security?